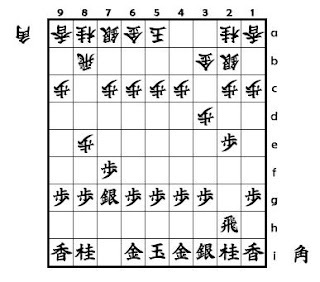 Yamajunn's Shogi opening traps: classcial Kakukawari opening : part 2.
classcial Kakukawari opening : part 2. Shogi Opening traps : classcial Kakukawari opening : part 2. 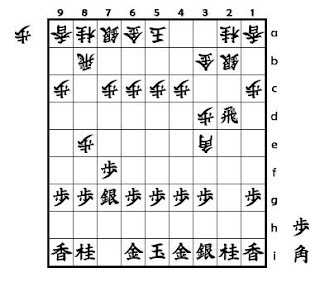 The moves shown above is the beginning of classical Kakukawari opening . In diagram 1 , you may think Sente can exchange the 2nd file Pawns with 7.P-2d . But this is a bad move . Why ? Sente exchanges the 2nd file Pawns by the Rook . Replying it , Gote drops a Bishop with 8...B*3e forking the 2d-Rook and the 5g-Pawn . After the diagram 2 , Sente will play his Rook to escape from the 3e-Bishop's attack , and 2 major lines exist ; (1)9.R-2h and (2) 9.Rx3d . Even if Sente selects any move , Gote will get an advantage by following moves .